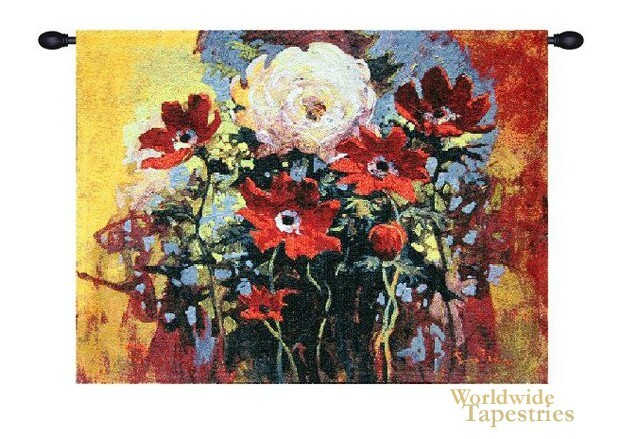 Floridly alive in tone color, this modern tapestry "Bouquet - Simon Bull" shows a bouquet of flowers. The works of Simon Bull shows his floral subjects in the borderline of realism meeting a dream state. Here we see the intensely colorful red and white peonies in a yellow, blue and red background that seems to glow as brightly as the flowers themselves. Simon Bull now resides in the US in California and originated from England in the UK, and lived in both Asia and Europe in his childhood years. This modern floral tapestry "Bouquet - Simon Bull" is backed with lining and has a tunnel for easy hanging. Note: tapestry rod and tassels, where pictured, are purchased separately. Dimensions: W 36" x H 29"